When the Masonry Dam was put into place 1915, it flooded Rainy Season Lake which became Rattlesnake Lake. The small town of Moncton was flooded by Rattlesnake Lake which was a surprise to the builders of the dam and to the residence of Moncton. There is a terrific slideshow of the town slowly flooding here. There are no rattlesnakes near Rattlesnake Lake, in fact there are no rattlesnakes on this side of the Cascade Mountains. Rattlesnake Lake and Rattlesnake Bluff got their names from the tall plants that had been plentiful in the area. When these plants dried, they had a rattle sound when in a breeze. The color of the lake is because of the glaciers. There is a top notch education center at the Cedar River Watershed and the meeting room was great too! The green roof at the visitor’s center was so interesting. This entry was posted in Government, Historic Sites, North Bend, Parks, WA State - King County and tagged 1912, Cedar River Watershed, flood, flooding, glacier, green roof, history, Masonry Dam, Moncton, North Bend, rain, Rainy Season Lake, Rattlesnake Bluff, Rattlesnake Lake on April 29, 2017 by admin. My dear friend and her daughter took me to a magical tea tasting room called The Cultured Cup at 13714 Gamma Rd. #104, Dallas, TX 75244 and it was a delightful experience. I didn’t know what we were getting ourselves into when we entered a nondescript building with minimal signage and walked through an office work area to fine a tasting room. There were nine of us tasting teas while we were there, three young couples and the three of us. The tasting room is open on the weekends and features different selections each time. Our guide, Kyle, was also happy to brew other teas that we were interested in. What struck me the most was just how welcoming and knowledgeable Kyle, one of the co-owners, was as he spent almost an hour introducing us to tea. He obviously has a passion about the history and process of making tea. To see him in action, go here. Anyway, I was so enchanted by the whole experience that I forgot to take a good photo, but their website has many lovely pictures and is an education unto itself. This entry was posted in Stores and other places that sell you things, Unique Shopping (stores with some personality) and tagged coffee, Cultured Cup, Dallas, history, tasting, Tea, TED Talk on August 23, 2016 by admin. The story is that Bonnie and Clyde’s car was in need of repair and they stopped at the service station on the town square in Granbury, TX. While it was being fixed, they had a picnic on the lawn of the courthouse. The local law recognized them, but decided to leave well enough alone since they did have a reputation! They finished their lunch, picked up their car and skedaddled out of there. I’m not sure if that is true, but the building is certainly there. The Baker-Rylee Building at 100 North Crockett Street in Granbury, TX was built in 1895 as a hardware store and has a limestone construction which is typical of the area. The Transcontinental Company bought the building in 1929 and removed two walls to make it into a service station. When my folks first moved to Granbury in 1981, it was still a service station though sometime in the early 1980s that use ceased. I remember going to it when it was an Italian Restaurant and now it is delightful restaurant called The Fillin’ Station. My swiss mushroom burger was one of the best that I’ve ever had and the fries and onion rings were also outstanding. The folks that work there are so very nice. 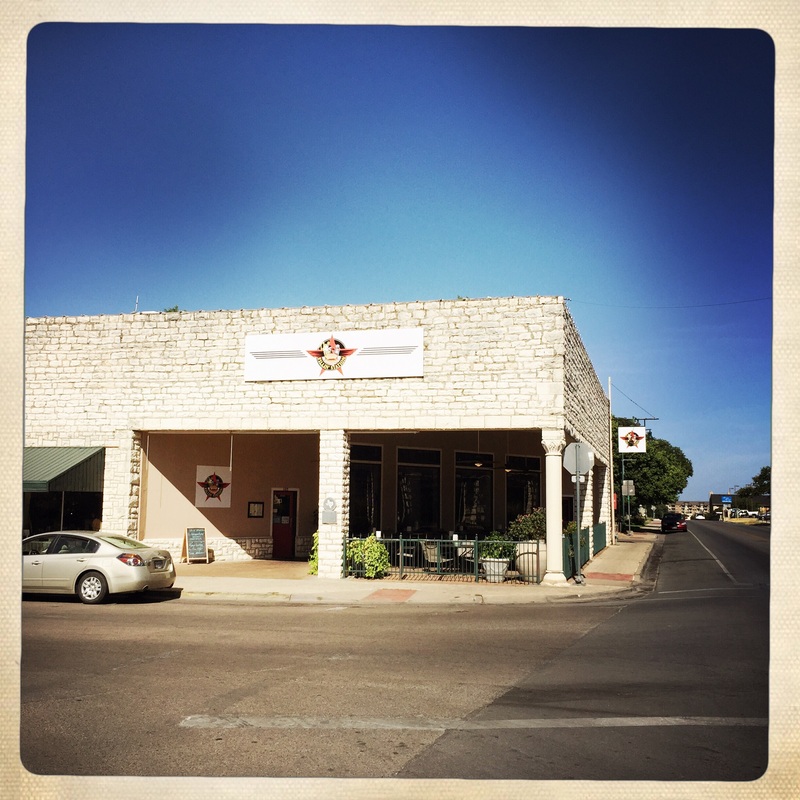 This entry was posted in Granbury, Historic Sites, Other States - Texas, Restaurants, Sit Down Establishments and tagged Bonnie & Clyde, Bonnie and Clyde, Bonnie Parker, Clyde Barrow, crime, Fillin' Station, Granbury, Granbury Square, historic, history, limestone, restaurant, Transcontinental on August 11, 2015 by admin. Granbury, Texas was named after General Hiram Bronson Granbury, which is sometimes spelled Granberry. His life spanned March 1, 1831 – November 30, 1864, passing away at the young age of 33 years. Per Wikipedia, he was a lawyer and country judge in Texas who later organized a volunteer company for the Confederate army and became its captain. He later was promoted to brigadier general and was one of the almost 2,000 soldiers that died at the Battle of Franklin on November 30, 1864. From what I’ve read, Granbury was buried near Franklin, Tennessee, where he died, and later re-interred at a different cemetery. 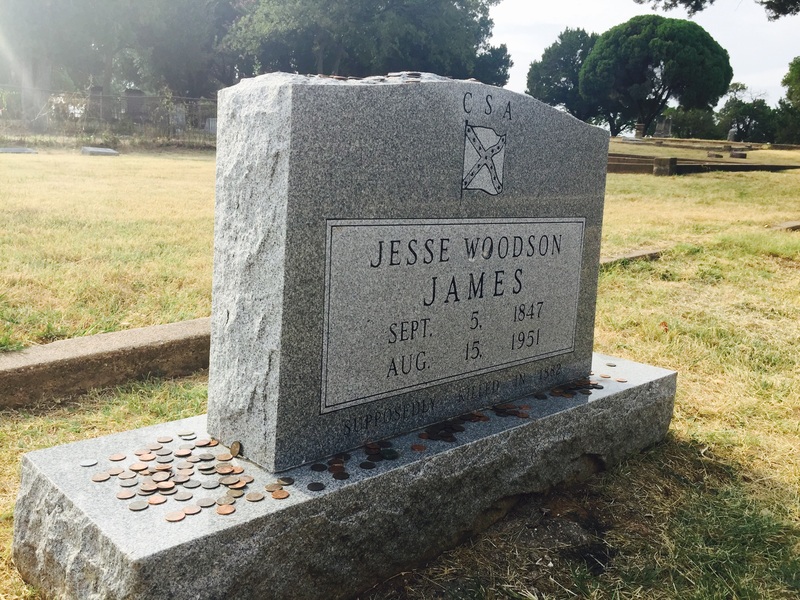 Finally in November 30, 1893 (on what would have been his 62nd birthday) he was again re-interred in the city of Granbury, Texas, seat of Hood County, as the town was named in his honor. Although he was as close as Waco, Texas, I’m not finding anything to suggest that he was ever in his name sake city. The statue which features Granbury in military garb and a confederate flag was erected in 1913. The statue was important from Italy and the base was created by Waxachachie monument maker, James Youngblood. 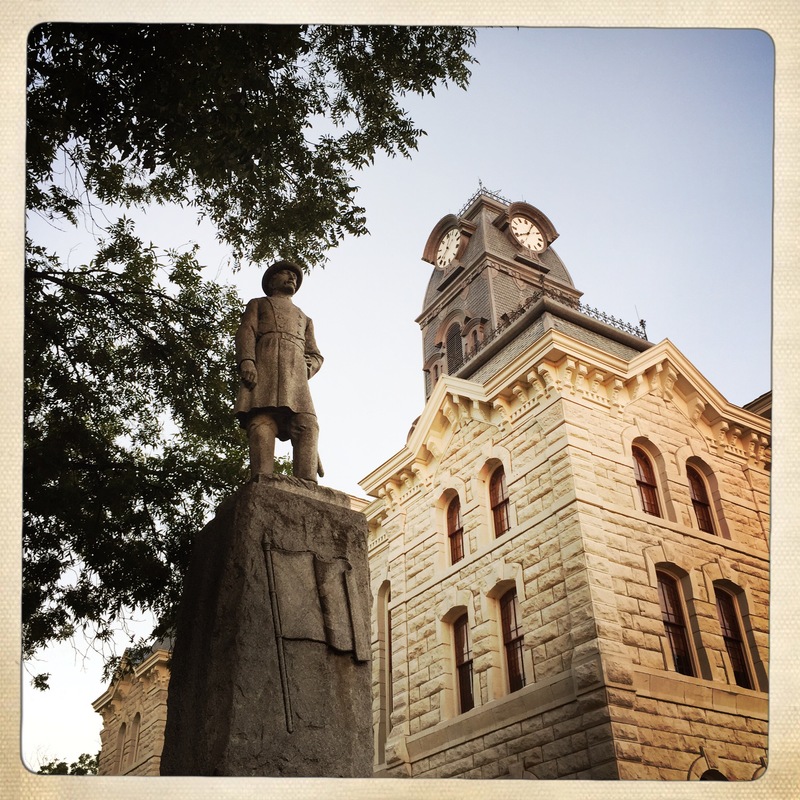 This entry was posted in Art -- there is art here!, Granbury, Historic Sites, Other States - Texas and tagged army, Captain, city of Granbury, Civil War, confederate, confederate flag, Granberry, Granbury, Hiram Bronson Granbury, Hiram Granbury, history, statue on August 9, 2015 by admin. 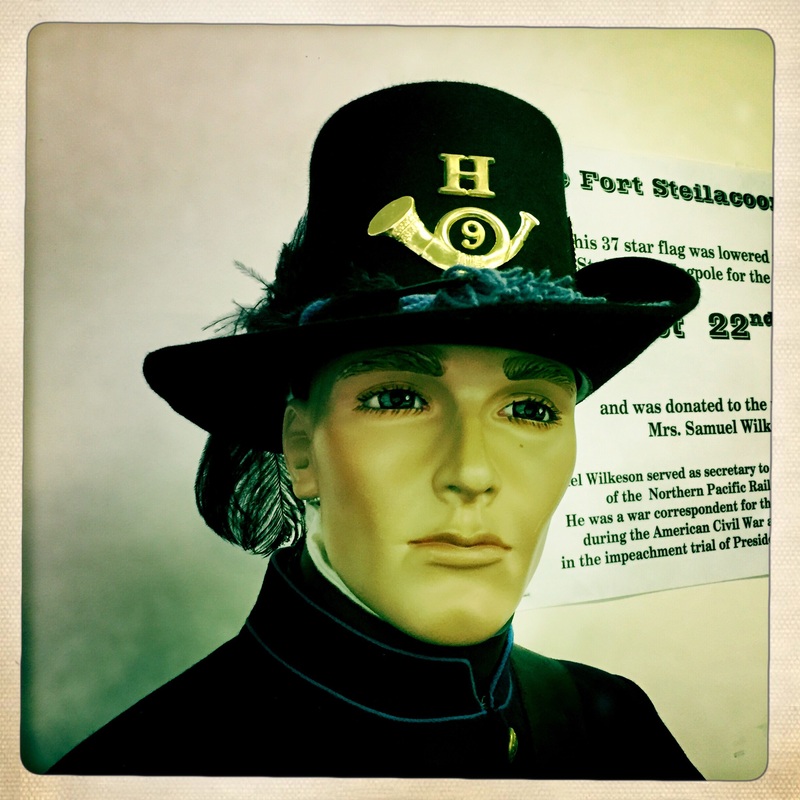 Once a year, the Tacoma Historical Society, Tacoma Cemetery and the Fort Nisqually Living History Museum join forces to produce a Living History Tour. Each historical reenactor is from the Fort Nisqually Time Travelers and has assumed the role of a Tacoma citizen in the time period around World War I. This is the 7th tour and the first that I remember that photography was allowed as long as we waited until the end of each talk and didn’t bother the actors. The list of those represented is here. Thanks to Tacoma Weekly! 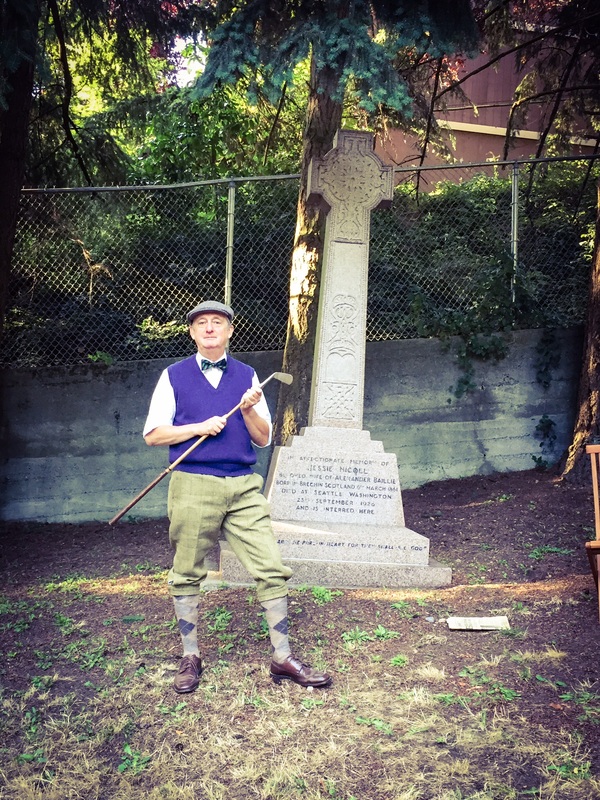 Alexander Baillie (with the golf club)- the founder of Tacoma Country & Golf Club. It isn’t often you actually see a twinkle in somebody’s eye! I loved the story about how he imported golf clubs from his beloved Scotland. When the port didn’t know what they were, he convinced the port officials that they were farming equipment so he had less of a tax burden. Annie Brown (white dress) – Annie and Oscar were the lighthouse keepers at Brown’s Point for many years. When she teared up talking about how she missed the lighthouse in her old age, I sniffed a little myself. Ada Bel Tutton Gifford (red dress) had a great hat, as she should since she owned a millinery shop on Broadway Avenue. I loved her pride in her accomplishments. Chester Thorne (arms to side), owner of Thornwood Castle and accomplished local businessman. He owned a yacht name the El Primero and President Taft was one of his more famous guests on it. He lost the yacht in a poker game. Peter Wallerich (hands folded in front), told some of his story in rhyme. He was responsible for the automotive industry situating on South Tacoma Way and bought the Northern Pacific Bank. Hugh and Mildred Wallace (couple) each told their stories of being part of high society. He was the ambassador to France and the French often honored him. She was the much loved daughter of a Chief Justice. They donated the clock tower chimes in Old City Hall to honor their daughter who died. Note to self, their house is still standing at 402 North J.
W.F. Sheard (with chair) has a shop across the street from the Tacoma Hotel and was well known for his furs. He is also known for designing the gold bead sight used on Winchester rifles and for bringing the totem pole in Firemen’s Park to Tacoma. This entry was posted in Cemetery, Once in a while events, Tacoma, WA State - Pierce County and tagged actors, Ada Bel Tutton Gifford, Alexander Baillie, Annie Brown, Cemetary, Chester Thorne, Fort Nisqually Time Travelers, history, Hugh Wallace, Living History, Mildred Wallace, once a year, Peter Wallerich, reenactors, Tacoma, Tacoma Weekly, tour, W.F. Sheard on July 18, 2015 by admin. On my way back from visiting dear daughter, I stopped at Olmstead Place State Park outside of Ellensburg (921 Ferguson Road, Ellensburg, WA 98926). I was pretty excited to be able to use my Discover Pass, but I didn’t spend too much time since I was worried (rightfully so) about snow on the Pass. The park has 217 acres and plenty of pioneer artifacts. Perhaps my favorite part was the red winged blackbirds. There was an entire flock of them on the overhead wires. More information can be found here. 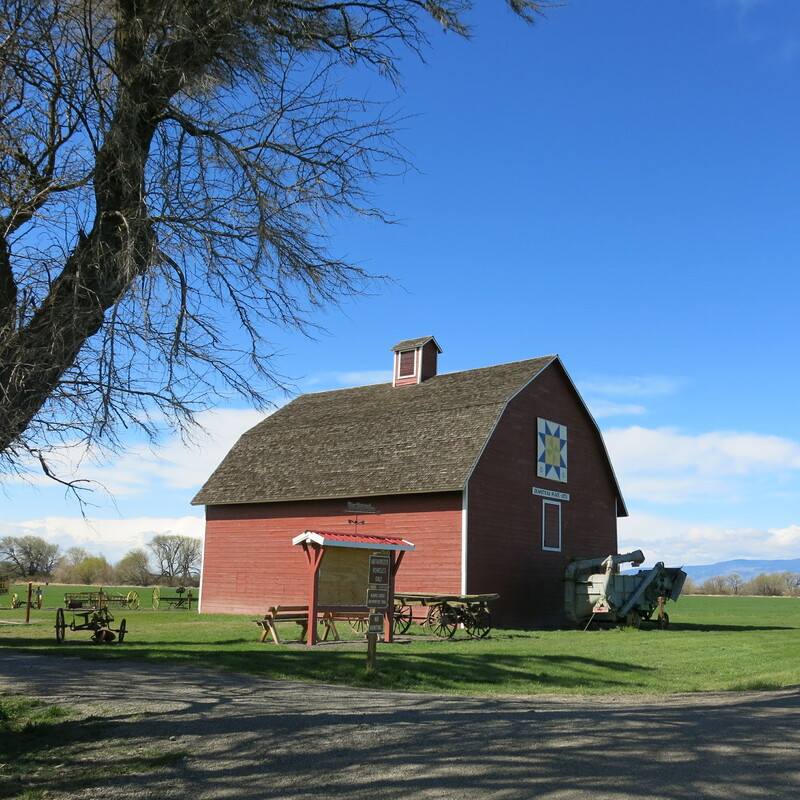 This entry was posted in Ellensburg, Historic Sites, Museums, WA State - Kittitas County and tagged Discovery Pass, Ellensburg, history, Olmstead Place, Park, pioneer, red winged blackbirds, state, State Park on April 21, 2015 by admin.